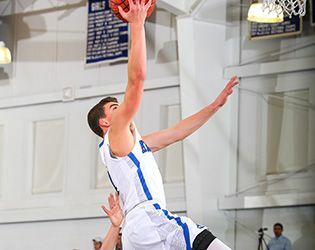 Saturday night, varsity boys' basketball won a nail-biter (54-51) over eighth-ranked Mater Dei High in the semifinal round of the NJSIAA South Jersey Non-Public B Tournament. Mater Dei came out strong, taking an early 9-0 lead, but Gill reduced that lead to 12-9 by the close of the first quarter and then tacked on 18 in the second quarter to edge out Mater Dei 27-26 at the half. In the second half of the game, Gill and Mater Dei continued to trade leads back and forth, and with fewer than two minutes on the clock, Mater Dei led 51-49. Two free throws, courtesy of Paul Mulcahy '19, gave Gill a one-point edge with 1:15 left on the clock, and a layup from Julius Stoma '16 brought the score to 54-51. In the final seconds. Adam Mitola '16 grabbed the rebound and passed to mid-court as the clock ran out, securing the win for Gill. Leading the scoring for the night was Jake Betlow '19 with 14, followed by Stoma with 9 points and 6 rebounds. Mulcahy added 8 points and 6 rebounds, and Connor Klementowicz '16, 8 points and 3 rebounds. Mitola contributed 7 points and 8 rebounds, including the game-ender. Last week, Mitola hit 15 points in the quarterfinal matchup against Wildwood Catholic. With the win, the boys advanced to the Non-Public B, South Sectional Final. They will take on Roselle Catholic tomorrow night at 7:00 p.m. at Jackson Liberty High School in Jackson, New Jersey. A spirit bus will leave campus at 5:00 p.m. for everyone who wants to go out and support the team.